Grange Springs is set in the beautiful Wye Valley, an area of outstanding natural beauty, with the Royal Forest of Dean bordering one side and the gently rolling hills and valleys of South Wales on the other. The lakes nestle in a hidden valley surrounded by open green fields, bordered by ancient hedges with native trees, enhanced with extensive planting of young saplings. 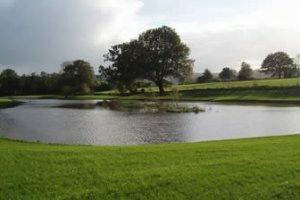 Kingfisher Lake is approximately 2.5acres and is stocked with carp, tench, bream, rud and chubb up to 10lbs in weight. Match bookings are available on this lake with prior arrangement and the lake has 28 pegs. Willow Lake is also approximately 2.5acres and is stocked with specimen carp and has Mirror and Common carp from 15lbs up to 25lbs, this lake has 20 pegs. If you are lucky you may even catch the ghost! Grange Springs Fishing Lakes 6 out of 10 based on 1 ratings. 1 user reviews. Only been here once and blanked, but i will be doubling my efferts this summer, as i have heard of some great stories for catching carp at this location! Wide choice of pegs that all offer a little bit of diffrence. Well worth arriving a few mintutes earlier than most to scope out your ideal peg.